Our last day of holiday we took Anna to a park downtown that had a children’s play area. It was like a big tree house/fort area. 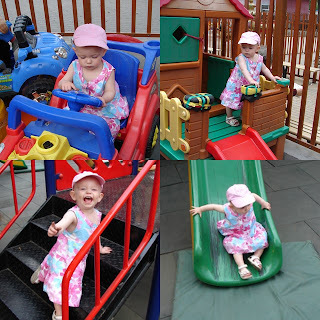 Anna is still a little to small to do most of the things they had but she absolutely loved the slides and stairs. She could spend hours just going up and down stairs if her mother did not get bored of them. She also loves to go down slides and can do it all by herself! It took her a little while to get used to sliding down wearing a dress but she quickly figured out to lean back and pull her feet up so she could go fast.